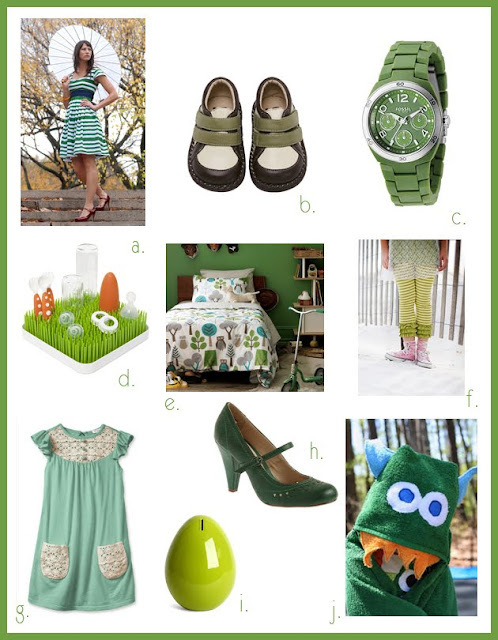 Tangled and True: color week: GREEN! Sorry for the late post. We arrived in Utah last night around 2 am. After 13 hours in the car Finn was not ready to lay down and sleep. It made for a looong night. I'd love to see your favorite green items in the comments!! A few days ago I posted about these super fun kelly green sandals. They are plastic! But I can't imagine a more happy shoe! They are even cuter in person! sorry it was a rough night...love those see kai run...so cute. I am in LOVE with this dress!! those shoes are a happy shoe! that dress is super cute too, thanks for sharing ladies! Oh, I love those green heels - I saw them at modcloth and was thinking of getting them, though I have very similar ones in yellow that I got a Target a while ago. Still, they are nice. That watch is particularly fun (although I don't wear watches).